On this page, we will introduce a partition tool, with which you can resize disk partition in VMware on Windows operating system. Download IM-Magic Partition Resizer Server to resize disk partition in VMware on Windows Server 2003/2008/2012 and Windows XP/7/8. It is not an easy job for Windows users to resize disk partition in VMware, because it is involved with VMware machine and data safety on the VMware partitions. However, things will become much easier if you can look for a professional and advanced partition too. IM-Magic Partition Resizer Server is Windows Server partition resizing software, which can resize disk partition on VMware disk on Windows Server OS and other Windows PC like Windows 7, Windows 8 and Windows XP and more. Download, install and run IM-Magic Partition Resizer Server. 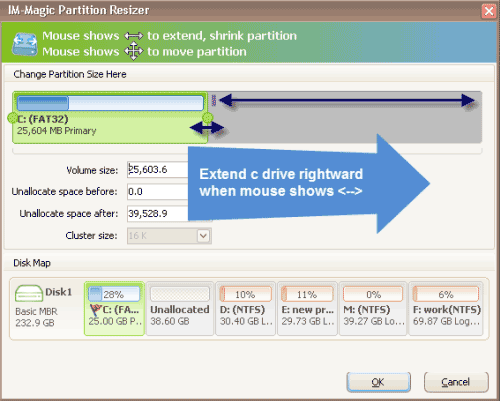 Right click a partition on the same Virtual disk and choose "Resize/Move" option. Move the arrows to shrink the selected partition. Then, you can produce some unallocated space. You need to move the unallocated space close to the partition you want to extend and then right click this partition and choose "Resize/Move". Can I extend C drive in Windows Server 2003 VMware? System partition on VMware disk is running out of disk space on Windows Server 2008, how can I resize C drive in VMware disk without reinstalling system? How to increase the size of disk partition on Windows Server 2008 VMware? 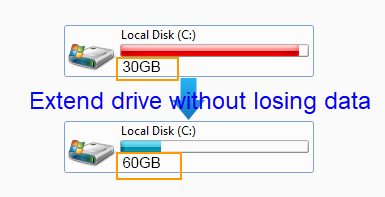 How can I extend disk volume on Windows 7 when Disk Management failed? Windows Server 2003 is one of the most common Windows Server OS used by computer users, so lots of Windows Server 2003 users often ask the questions about resizing disk partition. If disk partition is running out of space on Windows Server 2003 VMware, IM-Magic Partition Resizer Server can help you extend the disk partition easily within a few steps as long as there is free space on other partitions on the same Virtual disk. If there is no free space on other partitions on the same Virtual disk, you need to extend the virtual disk first before resizing the partition. With IM-Magic Partition Resizer Server, you can extend C drive on Windows Server 2003 VMware, resize system partition in VMware and resize data volume. Windows Server 2008 is another popular Windows Server OS that is widely used by computer users. IM-Magic Partition Resizer Server works on Windows 2008 operating system when disk partition is running on low space in VMware. This partition software enables you extend system partition or data volume no matter it is NTFS or FAT32 file system on Windows Server 2008. Further more, this partition software can also works on Windows Server SBS 2008, Windows Server 2008 R2 and more. Windows Server 2012 has much better performance and more functions than previous Server OS, but third-party partition software is still needed if you want to resize Virtual disk partition on Server 2012. IM-Magic Partition Resizer Server can help you resize disk partition in VMware on Windows Server 2012 without reinstall virtual disk or rebooting your computer. This partition software allows you to resolve the problem easily when running into low disk space on VMware disk on Windows Server 2012 or Windows Server 2012 R2. IM-Magic Partition Resizer Server can also help with partition resizing on Windows XP, Windows 7, Windows 8 and Windows Vista. This partition software works in a virtual environment normally, which will have no influence on VMware or the physical computer. The partition software can extend boot volume, primary partition, system partition and data partition without any limitation.